Image Attribute: A still from a China Central Television news clip about the Type 055-class destroyers. On July 3, 2018, China's People’s Liberation Army Navy (PLAN) launched two Type 055 Destroyers, an upscale development of the Type 052D (Luyang III)-class destroyers. 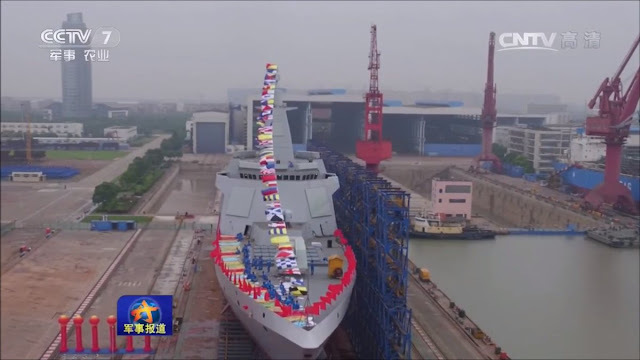 These newly launched destroyers are expected to play an instrumental role in China's future carrier strike formations and they come with an added capability to execute theater missile defense and sea-to-ground attacks. 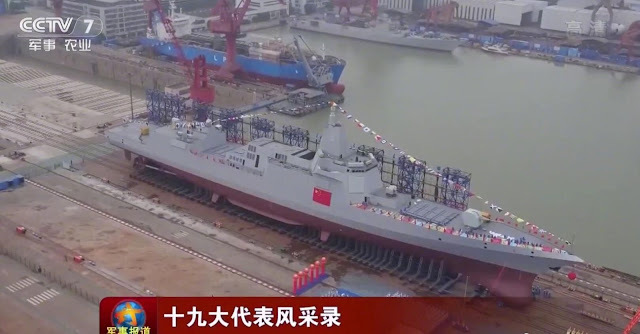 According to Chinese media, Type 055 is China's first home-grown 10,000-ton class missile destroyer, and the first and second ships of this type were launched by the Shanghai Jiangnan Shipyard Group in June 2017 and April 2018. However, according to the experts, the full-load displacement will be greater – in the region of 12–13,000 tonnes. The two vessels launched on Tuesday were built by the Dalian Shipyard Group. Both shipyards are under the China State Shipbuilding Corporation. The two new destroyers will undergo more work and testing before likely being accepted into PLAN service late next year. According to the sources, these Destroyers will form the backbone of China’s anti-missile defense system, working in tandem with the current Type 052D destroyer, serving as part of the so-called Chinese Aegis. The ships have a length of 180 meters, a beam of 20 meters and a draft of 6.6 meters for a full load displacement. It is equipped with 112 vertical launch systems (VLS). Also, it will be armed with an H/PJ-38 130mm main gun. It has been speculated, this class of ship can carry up to two Harbin Z-9C ASW or two Z-18 anti-submarine warfare (ASW) helicopters. These VLS are distributed in two places — 64x forward and 48x aft, just in front of the ship's double hangar. They are of the same model as those used on Type 052D, compatible with both hot and cold using Concentric Canister Launcher (CCL) technology, which provides greater versatility for launching the missiles of different designs and configurations. 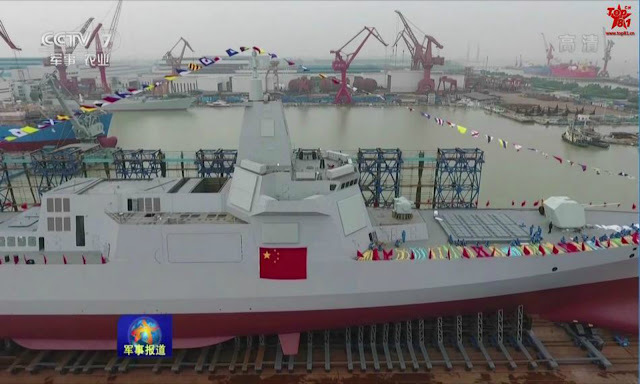 Song Zhongping, a military expert and TV commentator, told the Global Times - "Type 055 is the best fit for China's future electromagnetic gun, for the all-electric warship could meet the weapon's huge power supply demand." This is a capability that the Type-055 is projected to have in the next decade. *According to Chinese military experts, minimum 10 Type 055 are needed and many more will join PLAN's fleet in near future to accommodate a range of “diversified missions” throughout Asia and beyond.